I m not going to spend $2000-$3000 for a 10 inch table saw. Haven t done so yet, and not going to do so in the future. What I got now will last me the rest of my life, and it was a fraction of that amount. If I ever did feel the need for a 12 inch saw, I d set a budget for around $500 tops. Unisaws and PM66’s show up all the time for a lot less than $2000 (my Unisaw set me back less than $500). PM72’s and Delta 12/14’s as well. Grizzly and Jet machines even less. If you are going to spend $2000 on a Sawstop, then you would be getting a portable jobsite saw, as even the mid-range 1.75hp PCS starts with a base price a few hundred more than that. saws, etc. but not all. The few 12 inch cabinet saws I’ve seen weigh a ton (pun intended) but most 10 inch saws are much less. No, I have not researched some newer 12 inch saws like the Grizzly’s but I’m certain they weigh hundreds of pounds more than say, a Unisaw, which I was able to get into and out of my basement with a heavy duty refrigerator cart. I think the weight would be one of the biggest detractors to getting a 12 inch saw. How much greater depth of cut can you get from a 12 inch? I don’t think it is a full inch more but I could be wrong. Also, off topic was your avatar originally black and white and facing the other direction (or am I hallucinating?)? 19 1/2” – rolling table crosscut capacity 31” – two dovetailed mitre gauges 60°-0°-60° – one stationary mitre gauge on rolling table with right and left degree quadrants and positive locators – rack and pinion type fence – filter strips – four stock stops – 1 1/8” arbor (1” or 1 1/4” optional – advise). Rip capacity 36”. 16” Lexan guard, Warner electric brake. . . . . . . . . . . . . . . . . . . . . . . . . . . . . . . . . . . . . . . . . . . . . . . . . . . . . . . . . . . . . . . . . . . . . . . . . . . . . . . .
We have a northfield 18 inch table saw in the Purdue shop. I wouldn’t want to own it personally as the kerf is an entire 1/4 inch! Its also something like 10hp. (not entirely sure about this, Its yuuuge) So. Much. Saw. Its a screamer. The saw itself is nearly silent but when you have a blade on, it reaches that resonate frequency of a gazillion hertz at a bazillion decibels (super-accurate terminology) We use it for ripping 12/4 + boards in the rough before doing other milling. It is surprisingly accurate though. I have used it on occasion when the other cabinet saw is in use. Its just a little scary. It has all these guards on it that obscure the blade. Stupid osha. I think it can really be a hindrance sometimes. No need for that much cutting depth in a table saw. 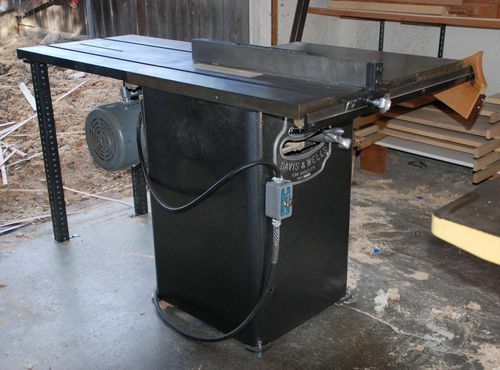 My Davis and Wells tablesaw will take a 12 inch blade or a 10 inch. The 12 inch blade cuts better then the 10. Rim speed is my guess. I feel like a show off right now. Woodworm…..you ll find that many will find all sorts of reasons to justify their actions. You probably are aware of the benefits of using a router with a 1/2 inch collet rather than a 1/4 inch,,,,well sorta applies here as well…...when the saw has a one inch or larger arbor…..you will experience smoother operation…...not to mention the additional weight benefit. Someone here posted about American Made saws and this Northfield company was brought up. I looked, very impressive piece of machinery. That said way beyond what I will ever need as a hobbyist for projects for me and the wife. But I did print it out and the price and have it in the shop. Anytime anyone asks what they can “get for me” I pull it out. How about this I ask. yeah sure…what??? Priceless…. I know I am a jerk! My friend has a Grizzly 12 inch table saw and the thing is grotesque. I have used it from time to time and it behaves about the same as mine. My 10 inch saw will do everything I want to do so why would I want something that just takes up extra space?